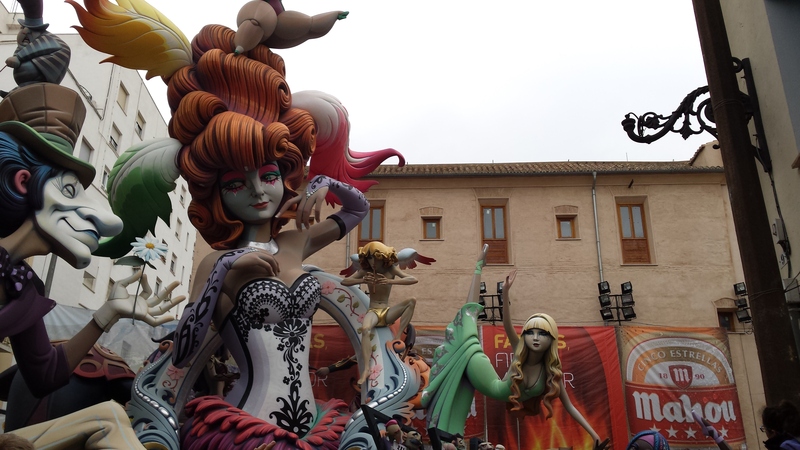 UPDATE: Click for Part 1 and Part 2 about Las Fallas. La Crema is the final event of Las Fallas, held on 19th March each year and concludes the celebrations which have been held throughout Valencia during March. ‘La Crema’ means ‘burning,’ which is essentially what happens to all the Sculptures which have been erected throughout the streets of the city for public display several days before the event (night of the 15-16th March). Las Fallas, however, is not simply a festival about burning; from what I took from my visit, Las Fallas has many dimensions to it. It is an artisitic festival: the Sculptures are a unique Valencian form of art (which I have never seen elsewhere! 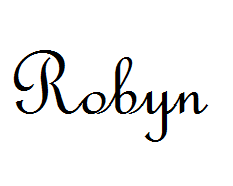 ), and they are beautiful. They are a form of intellectual expression: every Falla has been deeply thought through and has a satirical significance if you look for it. Las Fallas is a strengthening of the local community, to work together on year-long projects and to take pride in the city. It’s also an excuse for locals and tourists alike to have fun -Las Fallas is essentialy a party and with so much going on, it’s impossible to sleep during the festival! Lastly, where else in Europe are you going to see millions of euros turn to ash and find it impressive? Although La Crema is the highlight of the festival, I recommend walking around Valencia during the day and seeing as many of the Fallas Sculptures as you can, because they will be set on fire to never be seen again! After the Mascleta, that’s just what we did and we got to see so many! At 10pm, the Crema begins as the Infantil Fallas (small Fallas without satirical themes), which are held a few metres away from the main ones, are burned. The burning is signalled by the release of fireworks and we were amongst the crowds to run from Falla to Falla, following the noises and watching as each of them were set alight. It was very exciting but quite tiring on the feet! At midnight, the main Fallas are set alight, roughly 350 of them (!! 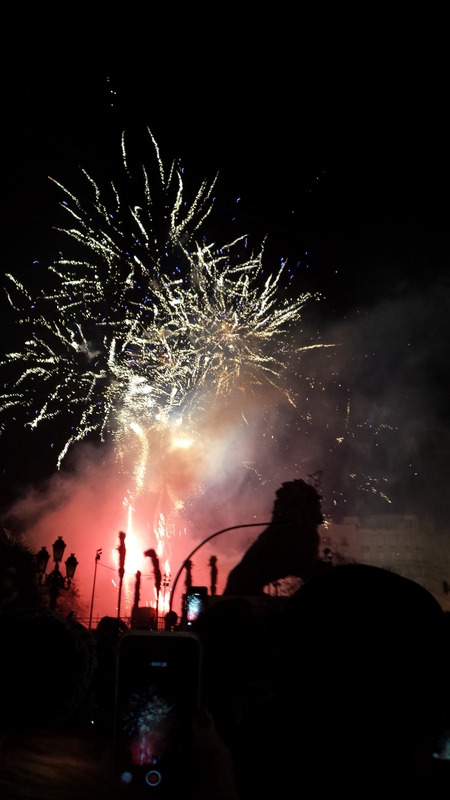 ), all except the Falla which won first prize (Falla del Pilar, 2015), which is burned at 12:30am, and the Falla of the Town Hall, Ajuntament, the final one the be burned which is at 1am. Falla del Pilar, 1st Prize 2015. It was absolutely imcredible – the biggest Falla we saw and very beautiful! 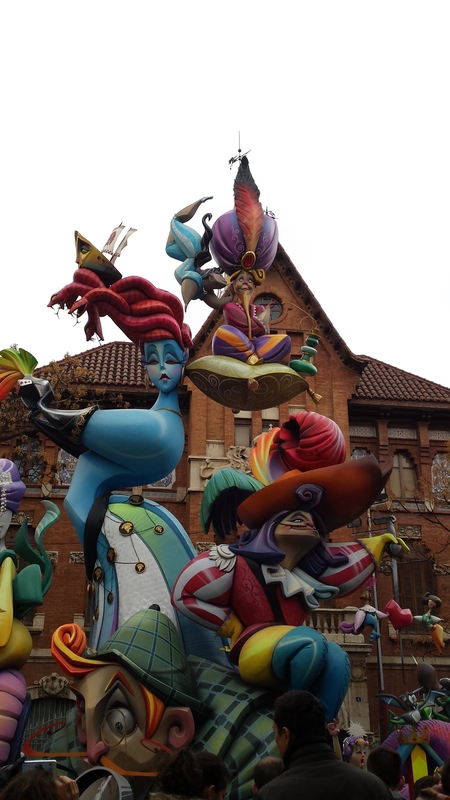 These Fallas cost thousands upon thousands of euros to design and construct each year, the budget is roughly 7€million this year in total for the festival! However the revenue from tourism throughout the festival makes up more than enough for the high expenditure of the events (roughly 300 million). And yet, each year they are set alight and turned to ashes, completely destroyed. So much thought and love has gone into these works of art, and although it is sad to see them destroyed, it is beautiful to remember that all good things must come to an end, even at Las Fallas. Luckily, the festival happens every year, so the cycle continues, breathing new life into the festivities. After watching many an Infantil Falla be burned, with the knowledge that the crowds would make it impossible to be able to see more than one main Falla be burned and see everything in time, we chose between the time slots of 12am, 12:30am for Pilar or 1am for the Adjuntament lion Falla. 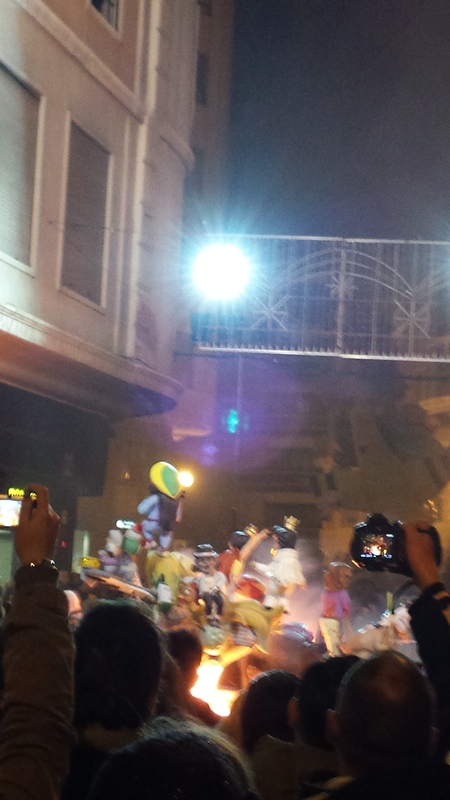 In the end, we made it to the Adjuntament Falla at 12am to get a good spot in the crowd to see it be set alight. However, we did have to stand waiting for an hour which felt like forever! It turned out to be a good plan as in no time at all, everyone else had the same idea as us and the Plaza was packed. At 1am, fireworks went off to signal the beginning of the Burning. It was really incredible how the Falla began to burn. I was expecting a random area to start to burn, but the craftsmenship of the Falla made the burning extremely controlled. At first, only the dove, a symbol of peace started to burn at the beginning, on the head of the Lion, and then the Lion’s mane started to burn. The fire came from the inside out, consuming the Falla and it took several minutes before it started to disintegrate. And that was it! Las Fallas was over, just like that. 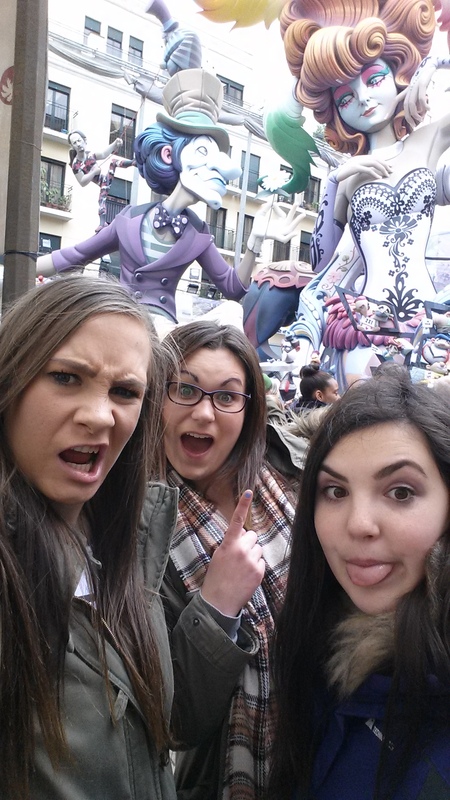 I had such an unbelievably good time in Valencia for Las Fallas, I can’t explain how impressed I was by it. Without a doubt the best thing I have done during my Year Abroad so far and I would love to book a trip to Valencia again in the future to take part in it all over again! Obviously, I’d hope for better weather, as this year was a wash-out (the worst in 80 years!) and I am currently suffering from a nasty cold since! There is so much to see and do during Las Fallas and Valencia itself. 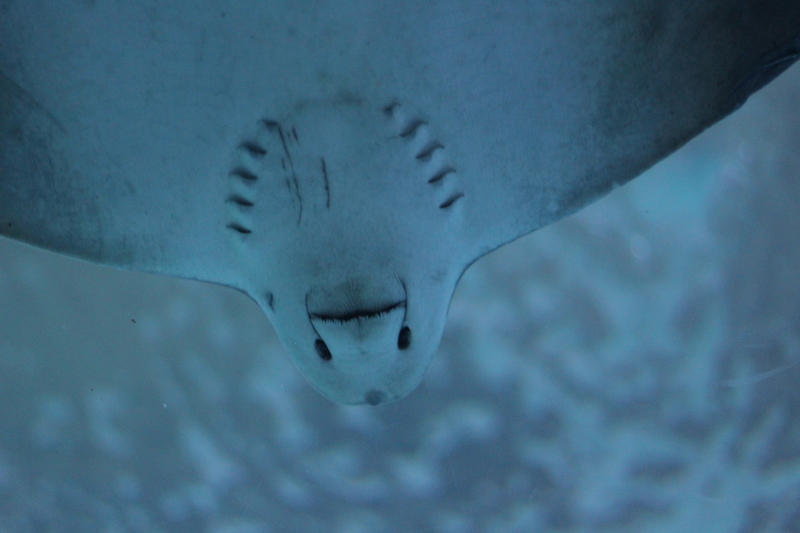 As Las Fallas finished on the Thursday, I had one final day in Valencia before I caught my early morning train to Madrid on the Saturday and we went to the amazing Oceanogràfic, the largest aquarium in Europe! It was the perfect end to a wonderful trip. 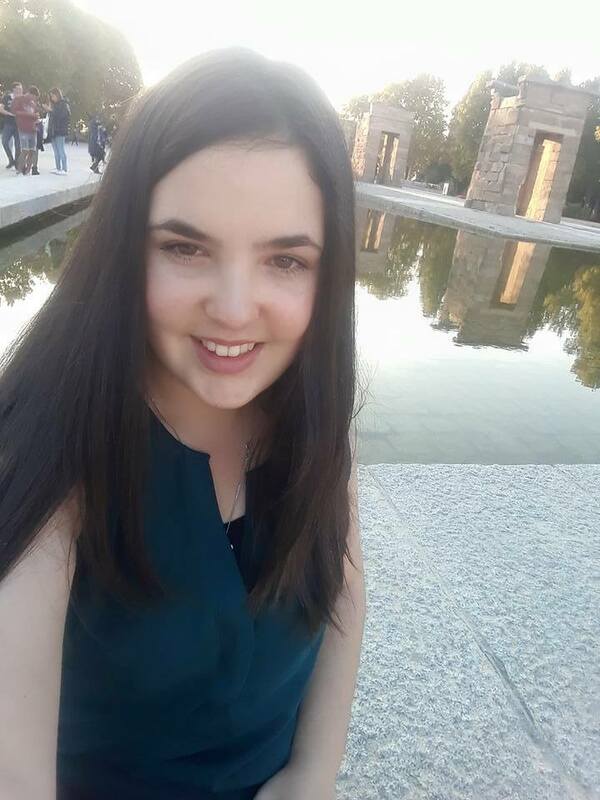 I am sad to see the end of Las Fallas, and would recommend anyone who has the opportunity in the future to go, to not hesitate in their decision! I’m off to Bilbao for the start of Semana Santa this weekend, spending the rest of the week in Salamanca before spending Easter Weekend at home in the UK. 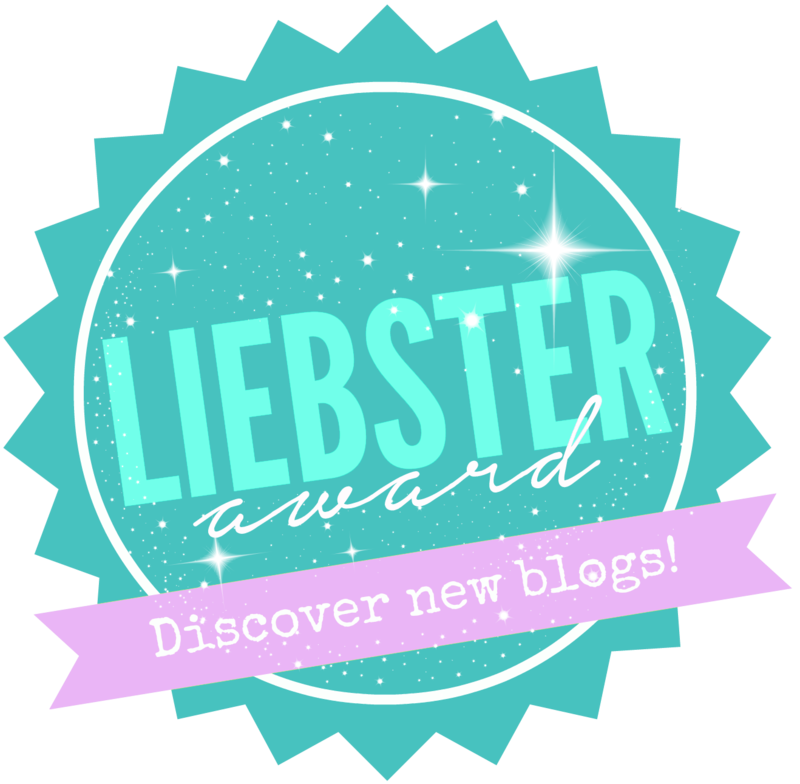 So many exciting things lined up!